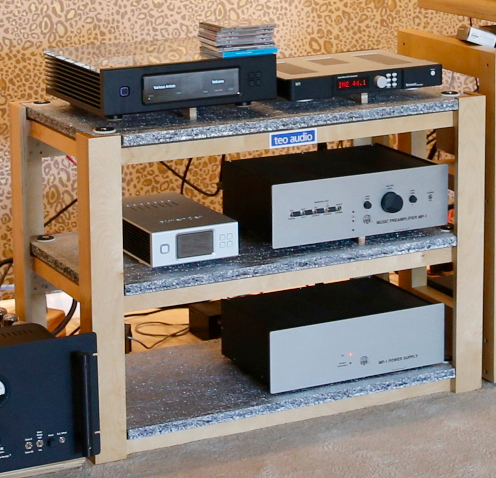 The Teo Audio equipment rack, shown here and in the large home page system images, is unique in several ways. The shelves are of aluminum foam, a material available in various densities and extremely strong and rigid yet very lightweight, which enables excellent vibration control and tuning. Judiciously placed damping materials are used, and the shelves are resiliently yet firmly mounted to the Baltic birch plywood frame, using Teo Audio’s Juicy Gems. The rack is available in many configurations including single and double width and with different numbers of shelves to suit customer needs.